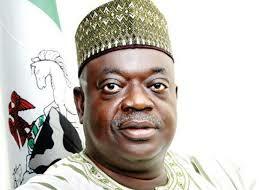 Immediate Past governor of Niger State Dr. Mu'azu Babangida Aliyu was yesterday booed and pelted with food packs at the inauguration of Governor Abubakar Sadiq Sani Bello. Aliyu was booed as he came into the stadium and got on the podium to take the guard salute, hostile supporters of Bello kept booing him, and shouting "ole, barawo". He was booed throughout the time he was on the podium and as he walked to his seat. Security was immediately beefed up as soldiers were brought in from the 31 artillery brigade, Army Barrack in Minna following fears that there would be violence and attacks on Aliyu at the end of the inauguration. As soon as Bello finished delivering his speech, the pelting increased as APC supporters threw stones, shoes and food packs at him. Immediately after the National anthem, soldiers started shooting into the air and releasing tear gas as there was a stampede as people scampered for safety. Aliyu was immediately whisked away from the stadium which was the venue of the inauguration amidst tight security led by the commissioner of Police Olushola Amore through the back gate. Bello was sworn in by his mother in-law, Justice Fati Lami Abubakar who is the chief Judge of Niger State. Aliyu whom a provision was made for to make a speech was unable to as his speech was skipped due to the hostility by supporters of Bello.